This is a well-crafted and versatile desk organizer handcrafted by 4KantDesign, a small handicraft studio from Germany. The wooden organizer measures 33 x 20 x 6cm. As we can see from the images, it features a minimalistic, geometry inspired appearance design, and it’s handmade from oak for a solid construction and natural aesthetic style. Meanwhile, the white base and natural wood grain deliver an elegant and vivid combination. The tray of the organizer measures 9 x 9cm in order to hold some small items like cards, clips, keys and more. Three pen holders are designed to keep your pens, pencils and Apple Pencil in place for easy access. Furthermore, it also works as a practical charging station. Using two custom grooves, it keeps your smartphone and tablet upright during charging, and an extra USB port is designed to charge other mobile devices. In addition, the hidden compartment not only keeps your charging cables organized, but also hold more items in order to deliver a neat and clean desktop. 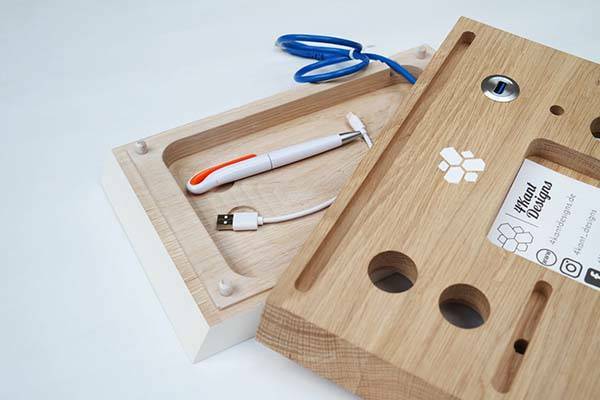 The handmade desk organizer with charging station is priced at $80.11 USD. If you’re interested, jump to Etsy for its more details. 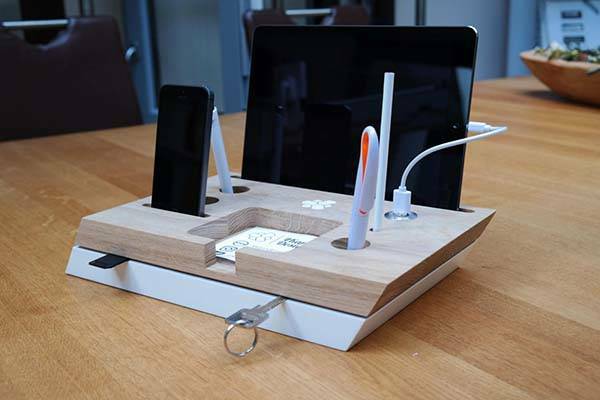 BTW, don’t miss the modular desk organizer and more cool gadgets by following tags.